Unfortunately IMATS is over and done with for another year. Sad times! As I said in a previous post, it came around really quickly and it was gone just as fast. I can't believe it was a week ago! It seems like just yesterday I was venturing across London to get to Kensington Olympia. Due to many different reasons I only ended up being able to attend the Saturday. Last year was my first year, I attended both days and was there for the majority of the time it was open. This year we (Leanne, Sheenie and myself) were out of there by lunchtime, which we were all quite surprised about. This year IMATS went back to its roots and was primarily focused on make artistry. There weren't talks on how to grow your blog and there weren't (to my knowledge) people screaming and crying over meeting their YouTube idol. Being allowed into IMATS without being a professional in the industry is a wonderful thing and one we shouldn't take for granted. I didn't end up taking many photos as it was quite crowded around the stands, so trying to get remotely close enough to get decent photos was a challenge in itself. I snapped a few and then popped my camera away for the rest of the day and enjoyed it as much as I could. Sugarpill exhibited for the first time and though their stand was on the small side, it was so lovely that Amy Doan aka Shrinkle was doing a 'meet and greet' of sorts with fans. We had a lovely little chat beforehand, in which she'd complimented my lip colour. 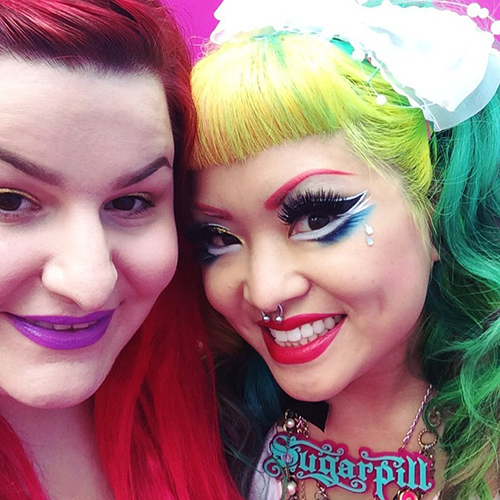 It was actually seeing OCC lip tar in Rollergirl on her IG that made me want to buy it to wear along to IMATS! She was absolutely lovely and it was a pleasure to meet her. Overall I had a really good day at IMATS and hope to spend the weekend there again next year.